Rabbi Levi Deitsch: Big Levi! To me, Levi Deitsch was always Chezzy’s “BIG Brother”. He was A very Big Guy, with a very Big Voice, A Big Smile and a very, very Big laugh, but most of all Levi had a HUGE heart. I will just share some memories that I have of Levi, whom I was very fortunate to know, even though he was a few years older than me. When i would walk down Crown Street, I would always bump into him, because I would go very often to the Giesinskys (my cousins) at 514, and we would meet in the back for a game of “Kickball” Oholei Torah style. Chessy and I celebrate our birthdays 1 day apart (28-9 Adar) so we celebrated together many times. In 1989, when we were in 3rd grade, Levi came to our class to Farbreng with us (he was about 12 at the time) and tell a story, in his booming voice, to bring Chayus and lebedigkait to us little kids. Some time earlier, I have no Idea when, but it must have been before 1987, I have a clear memory of being in Manhattan for some menorah Parade, and a group of boys were on a street corner doing Mivtzoim. It was a cold night, and they needed a ride back to crown heights. My father, who had a station wagon at the time, picked them up and they all piled into the back. One boy spoke up – Levi of course who was the natural leader of the group. I still remember him in the blue coat (the kind with the plush lining in the hood that had a zipper down the middle of the hood, so it could be opend up and held in position with two snaps at the edges. Those of you who grew up in CH in those years know what I’m talking about) Levi would have been not older than 10 at the time but was carrying on a conversation with my father! And giving everyone a good laugh. I owe my current position in the Yeshivah to Levi –seriously! Let me explain. In summer of Nun Vov (’96) most of my class had decided that we were going to go together to an out of town Yeshivah. We had put a lot of work into the group, and everything looked great. For the summer, most of the group went to the Yeshivas Kayitz in Italy, where Levi was a counselor. While they were there, Levi farbrenged with them the whole summer, that if they did not like the Yeshiva, then the correct approach was to stay there and make it better, not to run away, and seek “greener pastures” he succeeded in convincing them and they all decided to stay. Well I was at a different camp that summer, so I was not part of this new movement to stay in OT, so I continued with my original plan to go to T. for Yeshiva. As a matter of fact I was a little upset at Levi for “Messing Up” my plans. That Sukkos, I was farbrneging in “Deitsch's Sukka” at 518 – as I did many times, and I met up with Levi (something I did relatively often) so I asked him straight out “why did you do this” etc. 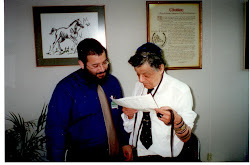 and he asked me a very powerful question (Levi could get quite serious when he needed to…) he said “What’s gonna be with all the guys in your class who are on their way out – or are already out of Yeshiva?! I – typically – answered: ‘well that’s not my problem’, what can I do about it anyway? There a bunch of… etc. Levi told me off! What do you mean “What can you do about it. You have a friend who dropped out? Call him up! Ask him how he’s doing, how his Yidishkait is doing! He’ll say he’s doing OK, but he won’t be OK but next time he’s wants to do something he shouldn’t he’ll stop and think “oh, soon Velvel is gonna call me and ask me how I’m doing, and I’ll want to answer “OK” and I want it to be truthful – and you’ll be keep another Yid close because He’ll know THAT SOMBAODY CARES ABOUT HIM!!! This was a completely new Idea to me. We stayed and Farbrenged about it for many, many hours. I know that it’s something Levi practiced, and I always saw it By Chessy, to keep in touch with EVERYONE. Today I serve as a Mashpia in Yeshiva in Miami Beach (where I had the pleasure of working with Nosson A”H last year) and I always place a special emphasis on feeling – and showing Ahavah to all my Talmidim, especially those who need the extra attention. Levi was the last person we saw in 770 before we went off to the airport as Talmidim Sheluchim to Melbourne, Australia in Cheshvon of 5761. A few weeks later he was engaged to Miriam Loebenstein. We were all so happy! We would get to attend his Chassunah (most of our group knew him from camp – who didn’t know Levi?!). You got it all wrong, said Reb Zalman, the Yeshiva didn’t need you to build their Library, rather you had the Zechus to build the Library at the Yeshiva…. I think that Levi really lived like this, seeing every opportunity, and challenge, as a Zechus to jump on, which of course, he did.